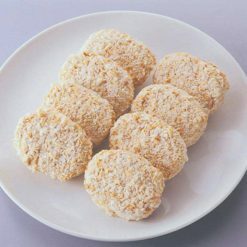 These croquettes are somewhat sweet, and are made to resemble a variety beloved in Shonan Hayama. 400g total (8 pieces, 50g each). 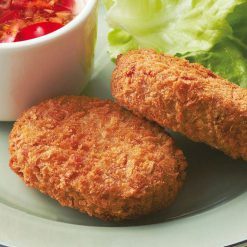 Kids will love these slightly sweet original beef croquettes. They are made using Irish Cobbler potatoes, and contain 25% beef free of therapeutic chemicals and antibiotics. Each of the croquettes has a crunchy coating with a handmade feel. They can be added to bento boxes or eaten as snacks. Hayama is known for its beaches, and for being the location of the Hayama Imperial Villa, which is one of the residences of Japan’s Imperial Family. To fry: Without defrosting them, place the croquettes in oil that has been heated to between 170℃ and 180℃ and fry for 5 to 7 minutes.Notes: Cooking times listed are approximations. Please adjust according to the quantity of oil used and the efficiency of the cookware.Do not fry a large number of croquettes all at the same time. The temperature of the oil will drop, resulting in the croquettes cooking inadequately or breaking apart.If there is frost on the croquettes it can cause the hot oil to jump, so please be sure to remove any outer frost before frying. This product contains vegetables (potatoes (domestic), onions (domestic)), beef (Australia), coating (panko, wheat flour, cornstarch), dehydrated mashed potatoes, sugar, soy sauce, table salt, pepper, thickener (guar gum).. This product is not suitable for anyone with allergies to wheat, beef or soy.